Accommodation Beechbrook House is approached by an attractive gabled porch, solid oak double doors lead to an impressive entrance hall with a lovely full height ceiling with ceiling rose and a minstrel's gallery on the first floor landing. The solid wood floor runs through the entrance hall and inner hallway. At the front of the house there is a luxury kitchen with solid wood fronted units topped with granite work surfaces and a matching central island, quality fitted appliances and tiled under-floor heating. A small bay window overlooks the front of the house and kitchen opens to a spacious family room. From this room there is access to the utility room and twin doors to a superb recently built conservatory with bi-fold doors that open onto a large paved sun terrace. The conservatory has a glass gable style ceiling and tiled under-floor heating. At the rear of the house is the dual aspect principal sitting room with feature fireplace, ceiling rose and ornate coving.
. Double doors lead through to a spacious dining room; French doors with adjacent windows lead from this room to an additional sun terrace on the other side of the house, double doors also lead to the inner hall. At the front of the house with access from the entrance hall there is a very good size bay fronted office and a ground floor cloakroom is also situated off the entrance hall.
. A galleried landing overlooks the entrance hall and front window and has doors to all of the first floor bedrooms. The master bedroom suite is situated at the rear of the property and is a double aspect room with a high ceiling and modern en-suite shower room and walk in dressing room. Bedroom two has fitted bedroom furniture with mirror fronted wardrobes and a door that leads through to another modern en-suite shower room. Bedrooms three, four and five have excellent proportions and the family bathroom features a large circular bath with power shower over and his and hers wash hand basins. A drop down ladder leads to a superb second floor cinema/entertaining room which has been well fitted and includes a cloakroom. 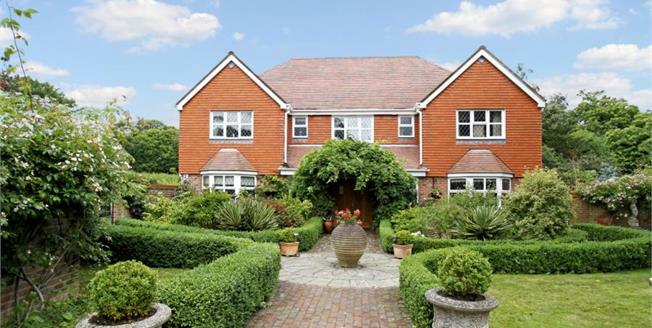 Garden & Grounds Beachbrook House is situated on a delightful plot with attractive gardens and an abundance of features. Access is via electronic gates that lead to a large driveway with turning circle adjacent to the double garage with twin doors and also leads through to a large storage room. Above the garage there is a room with an adjacent shower that is approached by drop-down ladder. A pathway leads through the formal box-hedged flower beds to the front door. There are also double gates through to the side garden has a long expanse of lawn and a superb split-level sun terrace. Adjacent to the garage is a further terrace and a greenhouse. At the rear of the house there is an expanse of lawn along with two timber sheds, a summerhouse and timber decking. On the eastern side of the gardens there is a further lawned area and paved terrace. All the areas of the garden have an abundance of flowers and trees of many varieties. Location Beachbrook House is situated in a superb semi rural location close to the village of Hambrook which has its own local shop and post office. Chichester city centre is approximately 6 miles distance and is a charming cathedral city with comprehensive shops and boutiques, excellent restaurants and cafes, and a number of cultural attractions. Picturesque Chichester Harbour is close by and provides a wealth of leisure activities and sailing and also includes the famous Bosham Harbour with its historic church. Rail links to London can be found at Chichester and Havant with services to London Victoria and London Waterloo and there are excellent schools in the Chichester and surrounding area.